The New South Wales Constitution Act 1855 had provided the legal framework to establish representative government in Queensland from the time the new Colony was created in 1859. With this new Act, the Queensland legislature adopted its own Constitution. The Act defines the powers and responsibilities of the government, which had been extended piecemeal from 1859. It removed any doubts and interpreted existing authorities under which the Colony had been constituted. The Act specifies the powers and privileges of the Governor, the Legislative Council and Legislative Assembly, rights over Crown Lands, raising of revenue, creating a Civil List, and pensions for judges. Among other provisions, the Act gave the Parliament power to alter the membership of the Legislative Council which had initially been set up by the Governor of New South Wales and was dominated by pastoral interests. The Act directs that any Bill for the alteration of the Constitution must be passed at its second and third readings by two-thirds of the members of the Council and Assembly, and be reserved for the Royal Assent. Five-year-long Parliaments were specified and the Legislative Council was organised as a nominee Chamber. This Act and the Constitution Amendment Act 1922 continue to be the founding constitutional enactments of Queensland. On 1 May 1860, New South Wales Governor Sir William Denison appointed the first 11 members of the Queensland Legislative Council for five-year terms. Subsequent appointments were made for life, the number expanded to 15 later in the month by Queensland's first Governor, Sir George Ferguson Bowen. The summonsing of a first Legislative Assembly was set in motion by proclamation on 20 December 1859, dividing the Colony into electoral districts, setting up an electoral roll, and the calling of the first election at a date not more than six months after the Colony was proclaimed. The first Legislative Assembly had 26 members. Both the Council and the Assembly first met on 22 May 1860. Robert GW Herbert was the first Premier and Colonial Secretary. The language of the 1859 Letters Patent and the Order-in-Council was afterwards construed by vested interests among pastoralists to suggest at least an initial limitation on manhood suffrage. Bowen did not agree: in March 1860 he described the 'gentlemen-squatters' as bearing a similar relation to 'other Australians that the Virginian planters of 100 years ago bore to other Americans'. The parliamentary and electoral process Bowen implemented created a political system similar to that in force in New South Wales, which had been granted representative and responsible government with a male franchise under the New South Wales Constitution Act 1855. The colony's only judge, Alfred Lutwyche, blocked the proposed act several times on the basis it would restrict universal suffrage. It was not until 1872 that full suffrage for men over 21 was granted in Queensland. The 1867 'omnibus' legislation consolidated and interpreted the various existing authorities under which Queensland had been constituted, clearly defining the powers and responsibilities of the government, which had been extended piecemeal from 1859. An important change was made in 1871: the need for a two-thirds majority for amendments to the Constitution remained; but measures affecting the representation of the people in the Assembly could be passed by a simple majority in both Houses. Bernays, CA, Queensland Politics During Sixty (1859–1919) Years, Govt. Printer, Brisbane, 1919. Fitzgerald, Ross, A History of Queensland: From the Dreaming to 1915, University of Queensland Press, Brisbane, 1982. Johnston, W Ross, The Call of the Land: A History of Queensland to the Present Day, Jacaranda, Brisbane, 1982. Waugh, John, The Rules: An Introduction to the Australian Constitutions, Melbourne University Press, Melbourne 1996. 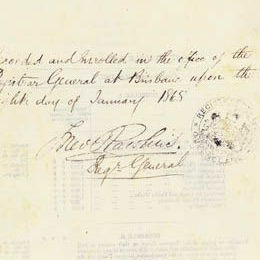 Detail from the last page of the Constitution Act 1867 (Qld) showing the signature and seal. Provenance: In Queensland the Governor signs three assent originals of new Acts. One is a record held by the Parliament; one by the Supreme Court; and one is a record of the Executive. Originally held in the Queensland Land Titles Office, this document is the Executive record and is now in the custody of Queensland State Archives. Features: Signature of the Governor and a seal with a ribbon.